Pigs are big, intelligent animals that are usually raised for their delicious meat on farms. They have a reputation for eating and eating and only stopping when the food is all gone. Sometimes, in cartoons, they're even shown eating old garbage like tin cans and boots! These depictions are a bit exaggerated, but they do prompt people to ask, "What do pigs eat?" The answer is that those cartoons are only a bit exaggerated, as pigs will eat nearly anything. They are omnivores and have extremely powerful digestive systems that can break down almost everything a pig can fit into its mouth. However, because pigs live in so many different environments, their diets are not always the same. Whether they are on a farm, in the wild or even living in a house, pigs are smart enough to adapt to any situation and any meal plan. What do Wild Pigs Eat? 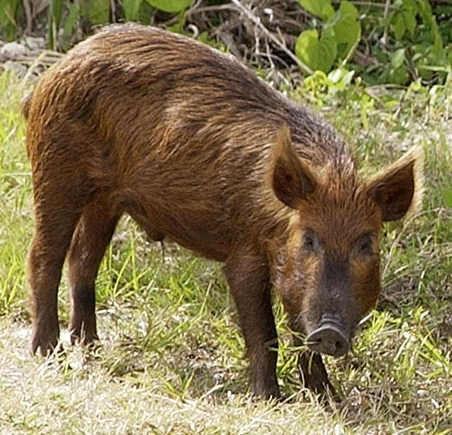 Wild pigs in North America are actually the descendants of escaped domestic pigs. They have thick, coarse hair and the males have long tusks that they use to protect their herds. These wild hogs primarily eat vegetation such as grass, leaves from trees and bushes, fruits such as berries and nuts like acorns or walnuts. Pigs also have a very good sense of smell and can find food underground. They use their snouts to dig up roots, tubers, truffles, bulbs and grubs that would otherwise be safe in the dirt. Other hog favorites are mushrooms, apples, worms, insects and snails. They will also eat meat if they can find it, including dead animals, birds and anything they can catch. Wild pigs are a pest for farmers, as they can often be found eating and trampling crops like potatoes, melons and soybeans. What do Pigs on Farms Eat? Domestic pigs have a very different diet compared to their wild cousins. The vast majority of pigs are raised in industrialized farms, where they are fed specially formulated feeds meant to keep them fat and healthy until they are turned into pork chops. This food is mostly made up of ground corn and soybean, but there are additional vitamins added to help them stay well-fed and happy. Once baby pigs are weaned from their mother's milk, they usually eat only this special feed. However, on small farms where the pigs are raised to support a family, they usually eat a bit more variety. Pigs are very useful on farms because they eat all of the leftover scraps and inedible items consumed by the family. These pigs get servings of old vegetables, egg shells, bones, spoiled milk and just about anything else their owners can't eat. What do Pet Pigs Eat? Not every pig lives in the wild or on a farm, though. Many people keep them as pets! The average pig is too big to keep in the house, but pot-bellied pigs are small, intelligent and able to be house-trained. So what do pigs eat when no one wants to eat them? Feeding a pet pig can be something of a challenge, despite their hungry attitude toward anything edible. Pigs are smart enough to learn how to open a refrigerator to grab a midnight snack, and can become overweight and spoiled with too many treats. There are foods designed specifically for pet pigs that are becoming more popular in feed stores, but a maintenance-type pig feed is also a viable option. On top of the standard feed, fresh vegetables and fruits make for a healthy pig treat and can be given daily. Pigs especially love vegetables like squash, potatoes, celery and cabbage, and fruits such as apples and bananas. Fruits are very sugary and should be kept to limited quantities, however. Most owners also feed their pigs hay and allow them to graze on grass to promote activity and healthy digestion. The question of what do pigs eat and what nutrition they need has been long studied by farmers. One of the reasons pigs make such excellent livestock is because, truthfully, they'll eat just about anything placed in front of them! In fact, pigs are so much like us in their eating habits that they are frequently used for medical research: just one more way this fascinating animal assists humanity every day.